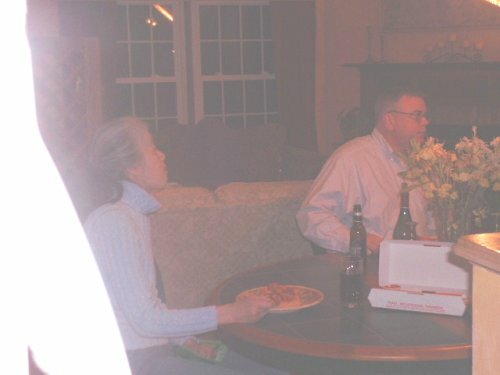 I decided last week to have a small get together Saturday night 03/18/06. Sort of a pot luck thing to celebrate my leaving work. 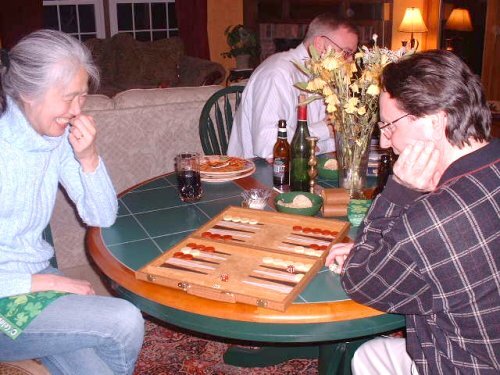 By the time things got going, however, it turned out to be worthy of the title The Great 2006 Unemployed Backgammon Tournament And Pot Luck Pity Party. We had a great time! 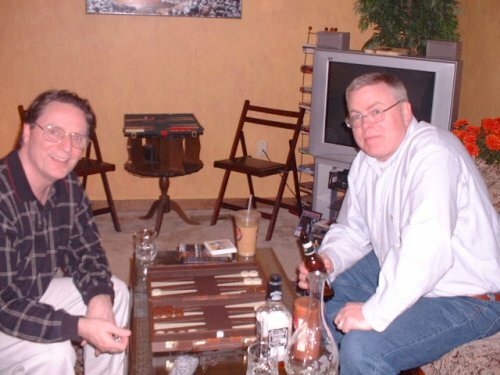 Played some backgammon, chatted about all sorts of stuff, and had an all around grand time. Then after a couple rounds of Jack Daniels (to ward off evil spirits and such...), we watched the movie Walk The Line about Johnny Cash - which was really good. 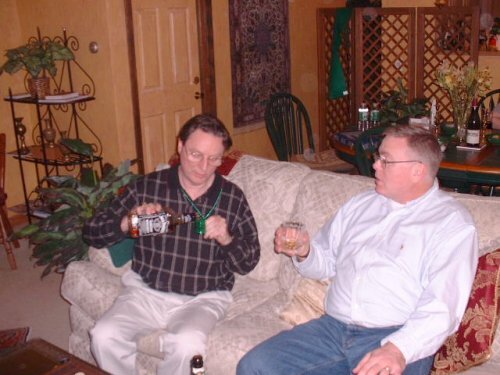 I was surprised that as many showed up as they did as this was St. Patrick's Day weekend and I had just had a party for that last weekend - The Great 2006 St. Patricks Day Backgammon Tournament And Irish Feast. We just all like to have fun and get together regardless of how often. Anyway, it was nice to share the evening with a great group of friends. 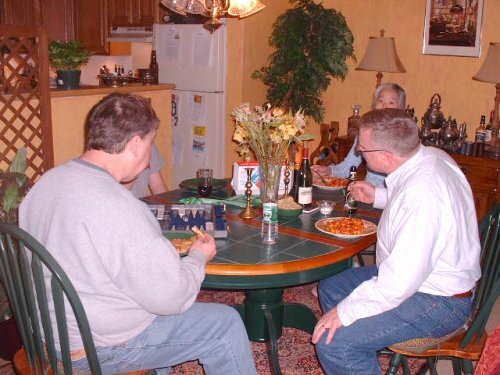 Gathering around the table for a little food and some combat backgammon. How great is this! Don't know what the photographer's problem is in this shot of Suzzie and Daivd Shaw, but you get the idea that the action is on. 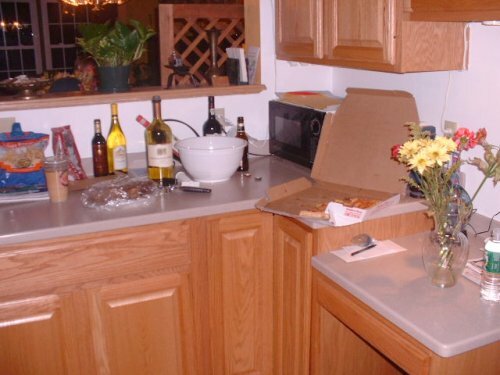 Killian's Irish Red to the right; pizza to the left: a truly balanced approach to life. 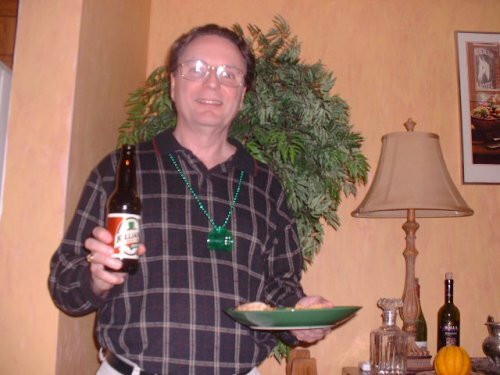 Note the green mini mug around my neck. This will be used later during The Great Jack Daniels Elixir Pity Remover Ceremony. It's a good thing there were no really late comers to this party as the food area is just about swept clean. Suzzie thought it hesterical that she threw 3 doubles in a row in this game against me that she subsequently went on to trap me on the bar for 5 throws to win the game. Ok, Suzzie: rack 'em up again 'cause you and I are fixin' to throw some dice. 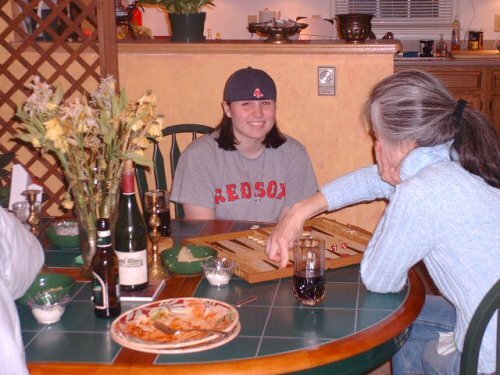 Marissa and Suzzie had some interesting games. Does Marissa's expression show just a hint of anticipation of good throws to come? 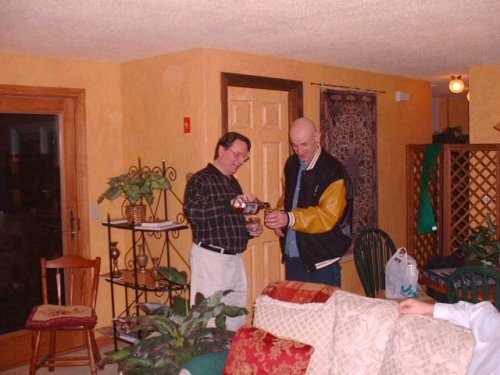 Preparing David Shaw of York, ME for the first round of The Great Jack Daniels Elixir Pity Remover Ceremony. Obviously, the participants of the first round of The Great Jack Daniels Elixir Pity Remover Ceremony approve of the results. Preparing Russ Jones from Laconia for the second round of The Great Jack Daniels Elixir Pity Remover Ceremony. It, too, was a success. 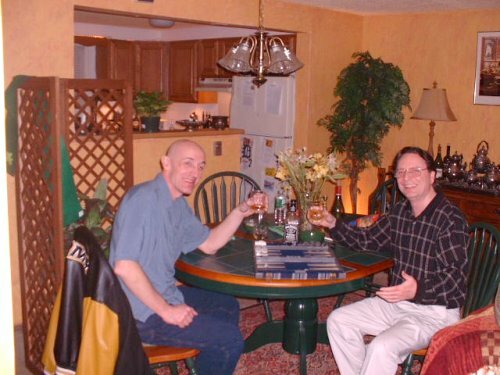 As can be clearly seen, The Great Jack Daniels Elixir Pity Remover Ceremony worked for David Shaw and I. 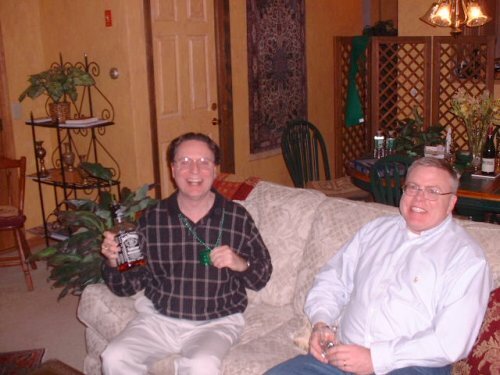 Unfortunately, I felt that The Great Jack Daniels Elixir Pity Remover Ceremony was not as successful with Russ Jones so we decided that another round was needed. 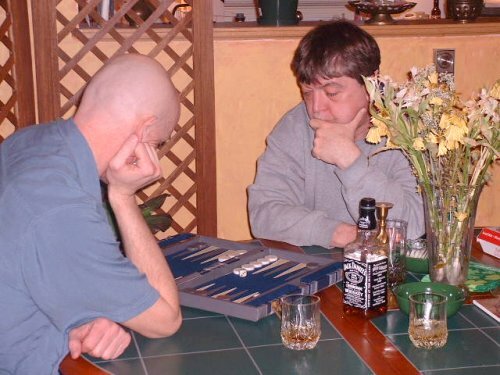 Are these two guys into it, or what! Russ Jones and Rick Downs battle it out in one of the final games of the night.